According to CNBC nearly half of small businesses do not have a website. We will build a professional website for your small business. Our web design process involves four simple steps. And then an optional ongoing step for website maintenance and updating services. Like many projects, the more time you put into planning your website, the better the outcome. In discovery we aim to fully understand your website purpose, your business & your ideal client. We will guide you gently through this process with our custom interview process. Many clients have found this process alone extremely valuable in identifying what is most important in their business. Laying out the structure of your website pages in advance ensures good quality navigation – a key performance requirement of any website. Good navigation translates to a good user experience so clients are more likely to stay on your website. Many website agencies or designers focus primarily on this aspect of a website. 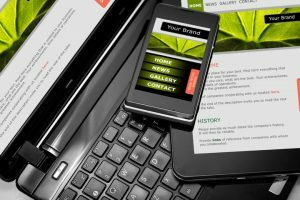 Yes, your website needs to look fantastic. And we will work with you to ensure the design fits with your branding and styling guide. If you dont really have a logo or style yet, we can assist with this too. Producing quality content is an essential component of any website. It must tell your prospective customers what you can offer them clearly and simply. Likewise the days of grabbing any old image is past. We recommend either appropriate stock images, or getting a commercial photographer to take a few key images to showcase you and your business. This is activity that stops most small business owners in their quest to build a website. If this is you, we can assist with this step with our content writers. This is the exciting part of the process where we put it all together. We will build your website in WordPress (free opensource software) with a variety of additional plugins and custom coding as needed. Developing the best mobile responsive website requires many skills including technical programming, graphical design, editing, and tipping cups of coffee over keyboards (oops). During this stage we will show you template drafts, specific page layouts and update you regularly on progress. When your site is close to complete we will invite you to test drive it! At launch we can hand over the controls to you so you can update and manage your site if you wish. Your website is your digital asset and isnt dependent on us for survival. Many of our clients prefer not to have worry about maintaining and updating their website on a daily or weekly basis. Of particular importance is ensuring your website is regularly backed up to ensure all your digital asset doesnt vanish in a momentary server glitch (yes, they do happen – MySpace lost 12 years of clients data in March 2019 for example). We offer a range of website maintenance plans to suit every business from basic update and security services to ongoing content and SEO.